I don’t know exactly what gutter these guys crawled out of, but they’ve apparently mixed with the same circle of next generation, punknroll diehards who play on bills with Don Bolles’ Alice Cooper covers band, the Earwigs, and the cream of the L.A. underground’s modernday vanguard—you know—Crazy Squeeze, Black Mambas, Telephone Lovers, Hammered Satin, Dirty Eyes. Keep yer electric eye on Dr. Boogie. Summa these dudes even jammed with the great JOEY PINTER of Knots and Waldos fame. With a killer logo designed by legendary pop art genius, Adam T. of Altamont Records, DR. BOOGIE are blazing their own smoky trail of snarling guitars, whorehouse pianos and honky tonkin’ harmonicas that impresses upon first listen. They could easily be mistaken for the Diamond Dogs, and that’s high praise, indeed. These dudes are coming on strong, right out of the gate. This is classic glitter glam nastiness blasting outta yer broken speakers with a bona fide sleazy, raunchy authority seldom ever heard in these cold, sterile times; when we’re all expected to nod along and talk about the facking same old gimmick crazed techno, hack actresses with ukeleles, or bogus banjo brigades, some more. You hellions and havenots all know what I’m talkin’ about-dark little old man bar music that celebrates the goodtimes, the booze, the girls and friends you better appreciate now ’cause tomorrow it might all be gone. These guys seem to really GET the “be alive now” part cause they rock with a true energy. LOVE the vocals and how often you hear me say that? Almost never. Last time we really got a whiff of a band that had this kinda scuzzy heart and soul AND a world class production value, courtesy of one Gabe Lowry, was probably that band, JET, who the Olympics ruined by overplaying their hit like ten years ago. They reminded me immediately of Jo Dog and Paul Black’s Sonic Boom, Dogs D’Amour, London Quireboys, Filthy Lucre. The voice is fabulously suited for this down and dirty style of regal guttersnipe ragged glory. If you like the Faces, the Bounty Hunters, the Jacobites, the Joneses, Free, Mott The Hoople, Flamin’ Groovies, or Silverhead, here are the new boys. In dark days like this, when the old guard keeps dying off, irreplaceable rocknroll heroes like Ian McLagan, Bobby Keyes, Billy Rath, etc., it’s encouraging to spot the sleazy rocknroll cavalry coming over the hill, knives clenched between their teeth. Scarves and tambourines and blue velvet suitjackets and loud laughs to be had–rocknroll the way it’s supposed to sound. Sharp shoes, sunglasses at night, swaggering lads out on the tiles. I can’t really find anything to not like about these guys. I wanted to make this record when I was in my twenties and almost died trying. I failed, where these guys have succeeded, in a supreme fashion. Chris P., Dustin James, Jeff Turpin, and Luis Herrera just have that magic thing that few ever really come by honest, anymore. This e.p. came out and grabbed me by my frilly blouse and made me wanna go on a diet and play billiards and dance on the bartops and preen by the cigarette machine. Okay you can see how long it’s been since I’ve been to the pub. These lads will make you want to wear feathers and form a dart team. Think Marionette Meets The Babys meets Detective with a little bit o’ Heartbreakers. Good lyrics, primo drummer, raunchy as hell guitars. This is really fabulous stuff. Rodney On The Roq is even spinning them. They look so young, too. This is probably every bit as good as that first Buck Cherry album. They are almost like a modern day Hollywood Brats. Go see DR. 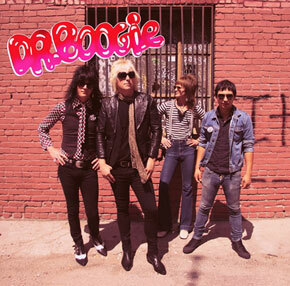 BOOGIE, one of the most promising pub rock/seventies radio pop/trashy punkroll/blues bands to storm the yellow brick road to the ever beckoning, eternally seductive neon lit Hollywood mirage, that always seems to promise strippers and cocaine on airplanes but usually only delivers heartache and despair, in like, forever. They even seem to have a desire to really bring the audience all aboard with them, show everybody a good time, you can just tell they are born entertainers. When was the last time a band cared about the people? The Babysitters? The Waldos? Been a long time, been a long, lonely, lonely, lonely time. You’re gonna love these cats. Trust me, I hate almost everybody. I love “Life On The Breadline”! This is full fledged Evil Kenievil rocknroll! I hope they get a bartender on stage with them like Rod and the boys. Fabulous stuff.